THESE four simple tips will help you make the most of your office workspace. Being more organised, and working in an environment that you enjoy, allows you to be more efficient and ultimately, more productive on the job. • Think first, organise next: People procrastinate about organising because they do not know where to start or they have not thought about why their office is not “working” for them. Take some time to think about why your space is not as effective as it could be. Do you need more storage, a larger desk or better lighting? Imagine what your ideal office would look like and move toward that picture. 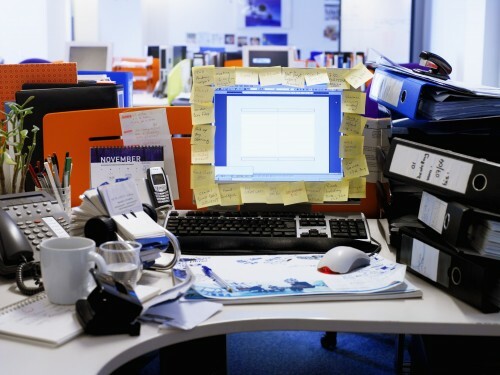 • Don’t let personal items hijack workspace: Offices do not have to be sterile environments, but personal effects can often take over so much space that there is no longer ample space to work. Use wall shelves, architectural ledges and small tables to display photos and mementos so you have room on your desk for working tools. • Keep your space at 80 per cent of capacity: Paper, books, binders and the like will continue to make their way into your office, so you need to make sure you have space for incoming items. Your goal in getting organised should be to have your space only 80 per cent full at all times. As you continually collect more stuff, you either need to offload paper, files, etc, to stay at 80 per cent, or increase your storage space. Those are the only two options. • Create a system for you: Magazines and catalogues are great for inspiration and ideas, but the organising systems were either created for the sole purpose of photographing them, or are in offices where they knew the photographer was coming. Don’t get caught up in how things “should” look or work. Create solutions that work with your working style, needs, habits and preferences. Getting organised is a process, not an event. By taking the time to think before you organise, you have greatly increased the odds that the organised space you have created will stay that way.